The Naturals is a group of teenagers taking part in a secret FBI crime-solving program. They are made up of: Michael, who reads facial expressions and emotions, Dean, a profiler, Sloane, a master of random statistics, Lia, a human lie detector, and Cassie, also a profiler, and the narrator. A singular childhood trauma awakened each of them to their individual gift. They don’t always get along, but are loyal to one another, the program, and the reason they have accepted the positions. At times they go beyond limits of authority, but this is due to unpredictable outcomes. We are confronted by the chilling voice of the UNSUB, named You, throughout the story. This point of view keeps the reader in the zone and turning the pages. This is the second book in this spectacular psychological crime thriller series for young adults. It is Criminal Minds slightly modified. Someone is copying Dean’s father’s killing methods. He has been behind bars for some years, so long-term admirers are considered possible suspects. The group’s assignment is to track down the killer through their distinctive methodology without being found out. When the bodies start to pile up, extraordinary actions come into play. Tension builds both in the house where the group lives, and in everybody that surrounds them. This series has the wow! factor. It’s a non-stop read without toilet breaks. The characters and dialogue sparkle with brilliance, and the plot thickens on every page. No one is who you imagine. There is a sizzling emotional love-triangle to spice things up, plus intimations of past relationship hovering between other characters. I love this series. 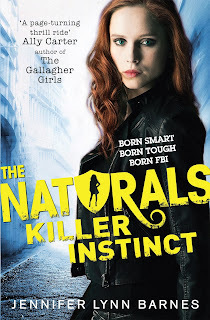 The first book, The Naturals, was released in November 2013 and Book 2 was too long in coming. The third is said to be due in November and I can’t wait. I’ve never anticipated any series the way I have this one as I was gripped from the first page to the last without exception.